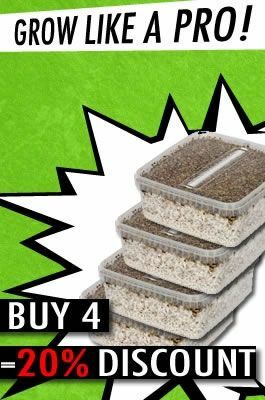 Avalons’s 100% Mycelium kits are 100% colonized by mycelium substrate to get the best yields possible. You don’t need to soak these under water, just a little spraying with water every now and then. If you follow the instructions, nothing can go wrong. You’ll get the best magic mushrooms with hardly any effort! Appearance: The cap (min. 50mm in diameter), starts out convex and becomes more plane upon growth. The colour wil change from redbrown to goldbrown to yellow, the long stem is yellow and meaty, the grey lamella or grill become blacker during maturity. Bereits beim ersten Flush etwa 200g nass. Leider blieb es dann auch dabei, da bei der Ernte den Pilzen an den Seiten (die ca. 1mm aus dem Cake schauten) zu wenig Aufmerksamkeit geschenkt wurde. Diese wuchsen während des 12h soakings weiter und färbten sich schließlich grün und schimmelten innerhalb eines Tages. Hierfür ist aber eher meine eigene Unfähigkeit anstatt das Growkit zu kritisieren. Allgemein eine funktionelle Box mit guten Erträgen. Side pinning leider etwas stark ausgeprägt deshalb —> 4 Sterne. I harvested 200g wet. Took 2.5gs. Trip was pretty strong! Stronger than 200ug LSD. Golden teachers provide an amazing healing experience with lots of universal information! But the kit didn't perform well. First flush 12g dried, second 6g and third 3g... I'm waiting for a fourth but don't expect much... Temperature and light were as needed. I've grown them before with better results. I don't know what happened this time. It's been a while since I bought those shroomies but the result from the mycelium boxes is always very satisfying. I could harvest 4x with a little less in the end but the same quality. They are strong in effect and can be dosed quite precise what i personally appreciate. First time review : Received the kit and started the growing process - 23 degrees C room temp for the 1st week - Pins emerged then used heat mat for the 2nd week. Harvested 210g wet then the 2nd flush not as much with only 70g wet followed by the 3rd with 10g wet. All in all it was a pleasant learning process. The Golden teachers are very powerful - Took 2g dried (using a food dehydrator) with a Friend and had a great time but really thinking back I should of taken them alone in a dark room for a more spiritual experience. Microdosing now weekly of 0.6g. Noticing that I am less stressed and more focused on things. Avalonmagicplants.com are very helpful with any questions but would of liked an email to state that the kits were out of stock at the time of ordering. Golden Teacher: only 3/5 because mostly side pinning. Nevertheless, about 160g not very nice mushrooms in about 14 days. Very strong in the effect. 5 out of 5 in total, since price / performance simply unbeatable!